About a month ago, I decided to keep track of my viewing time of WWE Monday Night Raw, ECW, TNA, and WWE Smackdown over the period of several months to see if I’m able to tell anything about the direction of the quality of the programming (e.g. am I watching less, more, or about the same). 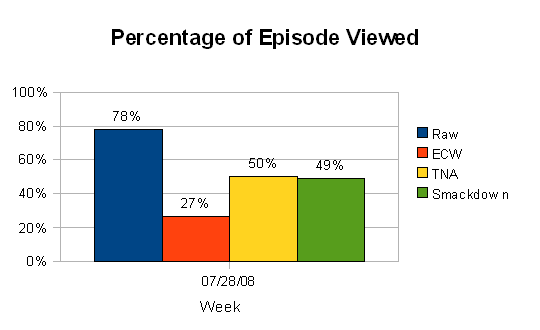 I think this will be the last weekly update I give on the viewing stats. It’s becoming clear that this thing is kind of like the stock market: up, down, up, down… Week to week things change quite a bit in one direction and then the other, so I think it will be the longer trend that may show something. I’m still planning on tracking each show, but I’ll only post something about once every 4 weeks to see if there are any noticeable changes. We’ll see how that ends up looking. I have 4 weeks of data for July, so I’ll probably post something on that later this week. 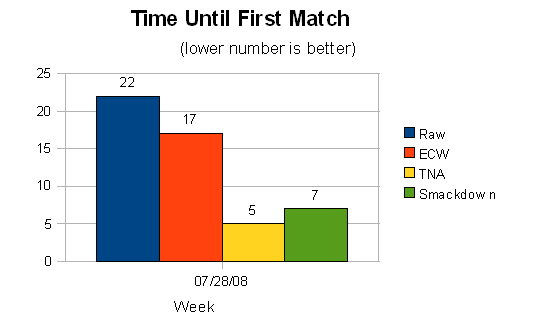 Last week Raw was back up above 20 minutes before airing the first match. They had an excuse the previous week because they were coming off a PPV. No excuse this week, and ECW was right up there with them. Even though Raw had a long wait until the first match, I ended up watching more of this program than any program in recent memory. For some reason the show held my interest more than usual. There was one match that stood out, and maybe the whole general manager shakeup was enough. ECW viewing was way down. My main reasons to watch ECW were CM Punk, Kofi Kingston, and seeing Bam Neely. Those guys have moved around to other programs so that’s probably why the Raw and Smackdown viewing was higher.